Removal the keyboard from Asus K50 K60 K70 P50 X50D series laptop is not difficult. First of all, turn off the laptop and disconnect the power adapter, remove the battery. 1. 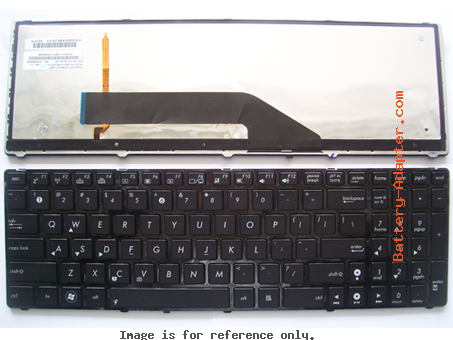 Open the laptop, there are five small spring loaded latches securing the keyboard, you can find them on the top edge of the keyboard..
2. In order to unlock the latch, simply press on it with a sharp object. At the same time pull the keyboard upwards. 3. After all latches unlocked, you can lift up the keyboard. 4. 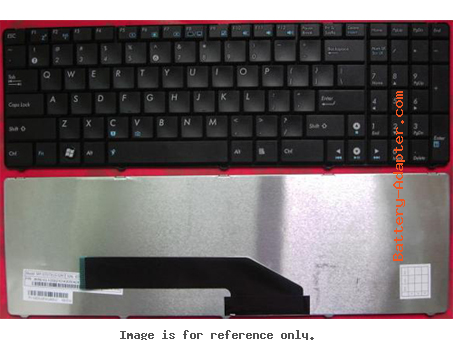 Carefully place the keyboard upside down on the palm rest. 5. The keyboard cable is jammed between the white connector base and brown locking clip. Before you can remove the cable, you have to unlock the connector. 6. Move the locking clip about 2 millimeters to the left (do not move any further). The locking clip must stay attached to the white base. 7. Now you can pull the cable from the connector and remove the keyboard. Reverse the procedure to install the Asus K50 K60 K70 P50 X50D keyboard.